Last year we shared with you the story of Karina and her dog Naida, who dutifully protected her when she spent nearly two weeks lost in the vast wilderness of Siberia. 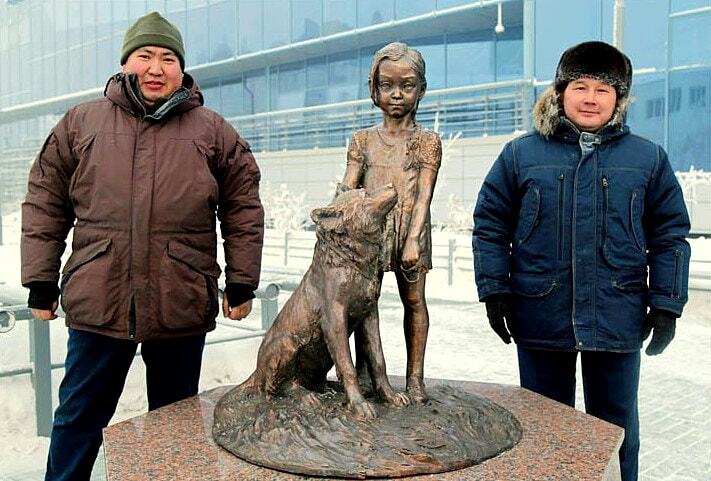 Naida only left the girl’s side to find people to come rescue them, and recently a statue was unveiled at the Yakutsk Airport dedicated to their perseverance. But the dog didn’t just return – he came to get people to find her. 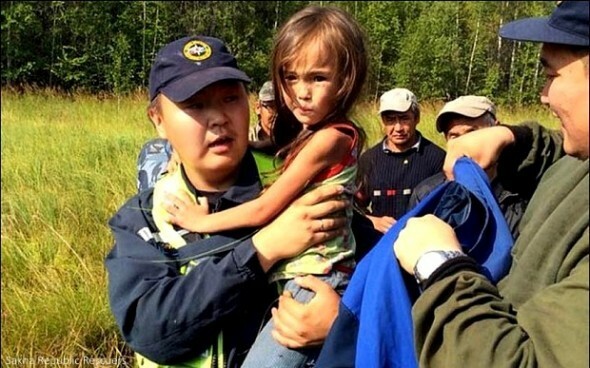 He led rescuers exactly to her. Karina had been hiding out in some tall grass, which is why she couldn’t be spotted from above. Miraculously, the scantily-clad girl only suffered from mosquito bites and a few scratches to her feet. 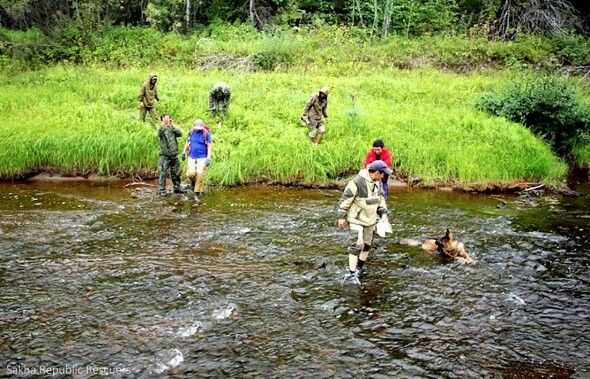 She told rescuers how she survived by eating berries and drinking water from streams. 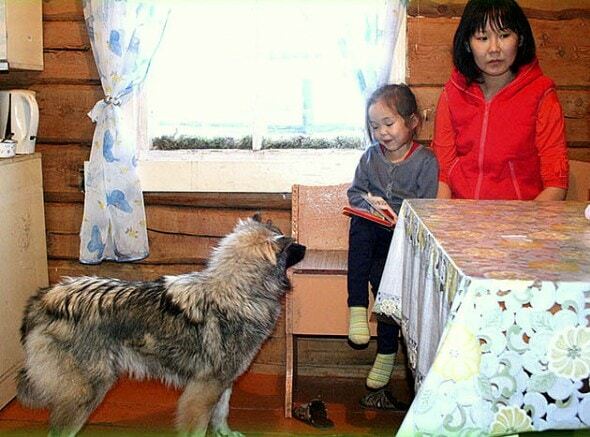 Karina’s grandmother, Emma, said that Karina’s first words to Naida when she returned were “Why did you leave me?” But because of this wonderful dog, she survived and was found before anything bad could happen. She made a complete recovery, and was for the most part unfazed by their sojourn. Nikolay Chochchasov was inspired by the pair’s stoutheartedness, and created a bronze sculpture in their likenesses. 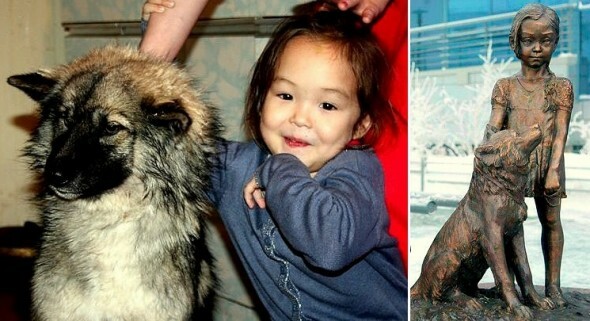 Karina recently celebrated her sixth birthday, around the same time the effigy was revealed by Yakutsk Airport’s general director, Nikolay Mestnikov. And the both deserves this statue, Naida is a brave hero!! They both touched the World with their incredible survival success! The deserve to be honored. Remember Hachiko? Dogs are awesome buddies. Two weeks to a child, and to the family, can seem forever. Thank heavens they had their faithful, loving, protective fur baby! Im not crying ? Nope…aint…gonna…??? beautiful story, beautiful the bond between human and animal!!!!!!!!! Four legged friends the only true friend you will have so guard them with your life. 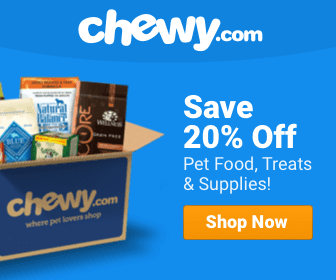 How wonderful are Dogs? We should cherish them and be so thankful we have them. Dogs never fall to blow my mind. Could be a great story for a movie ?? Naida a hero ?? Great story of another faithful Dog! Another HEROE dog!!! Beautiful story. What a miracle!! PTL the baby survived!! I LOVE dogs!! They’re truly our best friends and protectors. Gorgeous dog and brave girl. YaY Naida!!! Truly man’s best freind!!! What an amazing story,, should make a movie out of it ! what’s a little kid like that doing in the Siberian wilderness? How did she eat ? God bless. Smart good dog!!! Wow all I can say. Smart girl that knew how to survive and smart puppy dog.